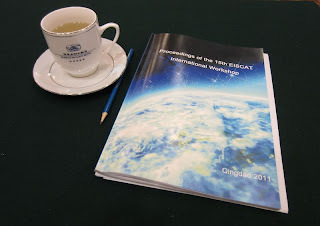 As we reported yesterday, EISCAT and other Incoherent Scatter Radar scientists from all over the world have come together this week in Qingdao, China, for the 15th International EISCAT Workshop. The scientific sessions so far include a session on the History of EISCAT, a session on middle-atmosphere work in which we learnt a lot about Polar Mesospheric Summer and Winter Echos (PMSE/PMWE) including their behaviour during active experiments, i.e. during heating experiments. Another session was dedicated to a view of a global ISR network, which really showed that the various groups ISR scientists are collaborating more and more and that this field has become a truly international field. Furthermore a session on space debris and meteors was held. This is a very well organised and civilised meeting, with friendly and comprehensive catering all around. One particularly nice feature is the constant availability of green tea at everyone's place in the lecture hall. The refreshing hot drink is readily waiting at the beginning of the session, and refilled during the sessions.